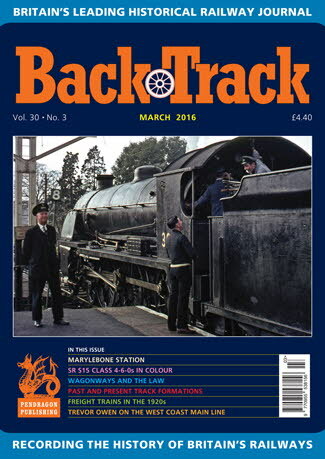 Railway Magazine | BackTrack March 2016 journal from Pendragon Publishing. Birkenhead Joint - colour spread on the lines between Warrington, Chester and Birkenhead. Wagonways and the Law - some early legal cases described by Michael Waterfield. Past and Present Track Formation: Part One - Michael B. Binks looks at the basic principles involved in creating a railway track bed. 'The Nearest Run Thing' - Marylebone Station and its Suburban Services: Part One - Geoffrey Skelsey considers the chequered history of London's last main line terminus. Freight Trains in the 1920s - George May offers some insights and reflections on their operation. Trevor Owen on the West Coast Main Line - a colour spread in tribute to a great photographer who died in late 2015. The S15 Class on the Southern - four colour pages on these useful 4-6-0 goods engines. The 'Royal Scots' as they used to be - archive photos of a great LMS express class before their rebuilding. Oswestry - Railway Town of the Welsh Borders: Part Two - Jeffrey Wells concludes his historical review of its development. Southern Airways: Part Two - War and Peace - the conclusion of R.A.S. Hennessey's survey of the SR's association with the new age of air travel. The Demise of Sir Francis Goldsmid... and others - Alistair F. Nisbet considers some unfortunate endings. Kirton Lime Sidings Signal Box - an illustrated description of this surviving Great Central box in Lincolnshire by Richard Foster.